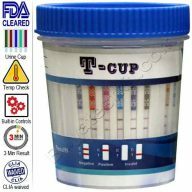 T-cup is a CLIA waived one-step integrated drugs of abuse test that detects five drugs together with a urine temperature check with an optional specimen validity test all in one product. 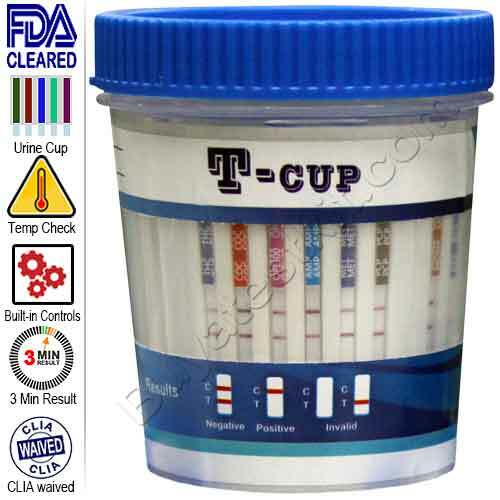 5 panel urine drug test cup. It conforms to NIDA cut-off levels. Shipped in boxes of 25 kits. For testing your child or family member at home. 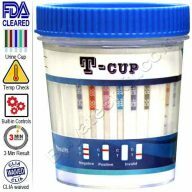 Wondfo, the manufacture of T-cups, are very reliable drug testing kits, the results produce clear, sharp test lines from every test with cut-off levels that conform to the National Institute on Drug Abuse (NIDA) guidelines. 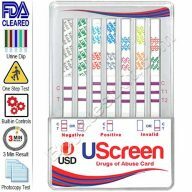 One of the most critical issues in drug screening today is the interference of common prescription and non-prescription drugs causing false-positives. This product does not suffer from this issue, avoiding specimens being sent to the laboratory, leading to a waste of time and money. Each cup has a temperature strip affixed to the side. Testing the temperature is an essential aspect of drug testing, if the temperature is out of range, it is generally an indication that the specimen was substituted. We recommend you check the urine sample temperature within one minute from the time of collection. The temperature range should be from 93° to 98° F. If the specimen is out of range, ask the donor to provide a new sample. The illustration below shows the various possibilities for the result. Negative: Both the test (T) and control (C) line must be present. If the line is faint, it’s still negative. The donor passed the test, discard the sample and the document the result. 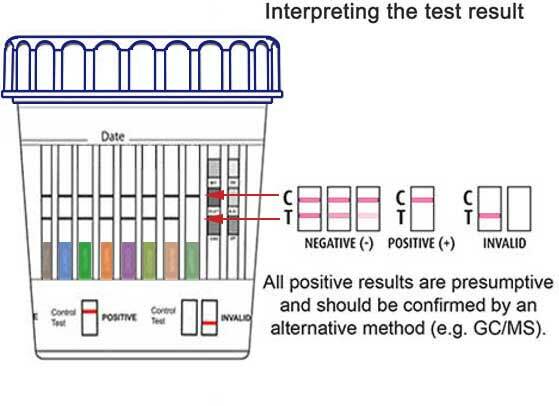 Presumed positive: If the apparent test (T) line is not visible; this indicates that a drug has been detected and is above the cut-off level for that drug. 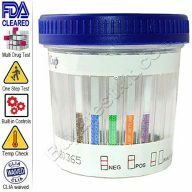 Send the sample in the cup to a SAMHSA approved laboratory to confirm your suspicion. 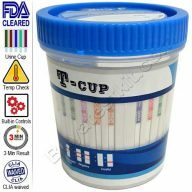 Included in each box are instructions for the T-cup 5 panel urine drug test cup. You can also download a copy by clicking the data-sheet link below.